No. I think you're only imagining that you see, that which you wish to see. The enthusiasm for the ongoing Petrenko cycle of the symphonies, for only one instance, belies your thesis. Bingo. Out in the real world (concerts and recordings), DSCH is as big as ever. Sorry if it disappoints you. Mr. Toucan, you're exactly like James: you ask a question and if the answer is not to your liking you start ranting. What's the point of asking it in the first place? Surgically done, Monsieur le Comte. Naxos itself is fading. .. These people themselves are fading. That's three claimed instances of "fading," and yet "toucan" has yet to provide evidence for such fades. Perhaps "toucan" himself is fading? Let's check the colors in his avatar tomorrow. When I saw the title of the thread, my first thought was, "He's already dead." Upon viewing the content, I think it's safe to say no. Shostakovich was surprisingly ill-represented in one of the many meaningless GMG polls of The Best, it is true, but his music is ever-more popular in concert halls and ever-better loved by wide audiences. One of my best friends was led into classical music by Shostakovich, and thinks the composer an ideal way of bringing the new generation to classical, because he is a core part of the canon, emotionally complex and compelling, and also a composer who speaks in a modern, vivid language which can still strike to our cores. I once met at a concert a pair of 20-something African-Americans with baggy blue jeans and red boxer shorts and chains and the like, who said they made sure to hear every live Shostakovich piece offered in Houston. What other composer can brag of that? Enthousiasm for a Naxos cycle: what a joke! Naxos itself is fading. ...Naxos musicians over the great musicians. What a joke indeed! For anyone with the least bit of knowledge about Naxos, this is a bit like listening to the Glenn Beck Program. The stuff Naxos is up to these days is immensely exciting, and given that they now regularly record artists like Cho-Liang Lin, the London Symphony Orchestra, and Aldo Ciccolini, there is no pejorative in "Naxos musicians." Indeed, this month's Naxos Blu-Ray release features Valery Gergiev conducting the Vienna Philharmonic in Berlioz' Benvenuto Cellini. For anyone with the least bit of knowledge about Naxos, this is a bit like listening to the Glenn Beck Program. The stuff Naxos is up to these days is immensely exciting, and given that they now regularly record artists like Cho-Liang Lin, the London Symphony Orchestra, and Aldo Ciccolini, there is no pejorative in "Naxos musicians." Yeah, I thought this was funny too. It's like toucan hasn't looked at the Naxos catalogue since 1994. Shostakovich's music fading? Are you kidding me? His stature and reputation is growing by leaps in bounds, as well as his general popularity. He is among the Top 5 (easily) composers of the 20th Century, and perhaps even Top 3 (after Stravinsky and Bartok). Enthousiasm for a Naxos cycle: what a joke! Naxos itself is fading. It used to be the internet was riddled with people who let the cost of a CD determine their taste: thus their preference for Naxos musicians over the great musicians. These people themselves are fading. The growing opinion currently is, while you might have to buy Naxos if you want recordings of obscure or unknown composers, you may want to turn elsewhere for good recordings of Beethoven, Schubert, etc. If all there is left of Shostakovich is Naxos then Shostakovich himself is indeed turning into an obscure & forgotten composer. And methinks it the so-called Apollon who is taking his wishes for realities, - once again! Why is there no ROTFLOL smiley? In the 70's EMI turned Karajan down for a few Shostakovich symphony recordings. Now they have just finished a cycle with Jansons, and since then cycles by Rostropovich, Kitajenko, Caetani, Ashkenazy, Barshai, Jarvi have been released with the venerable Haitink still available and more coming. That's what you call "fading?"
. . . That's what you call "fading?" Well, in comparison to that “rising star” Boulez (nyuk-nyuk-nyuk). toucan is in dire denial that the whole musical world thinks highly of Shostakovich, where Boulez enjoys a . . . niche audience at best. 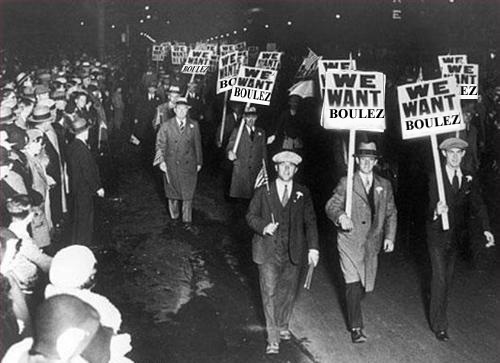 Clearly Boulez could increase his popularity with a few Shosty recordings. My take on Toucan's "fading" thesis is simple. It's only in their mind. To say that Shostakovich's influence is waning is proof enough that Toucan doesn't know what the hell he/she is talking about in the first place. I don't know, Karl. The last time my local band programmed Shostakovich (the First Violin Concerto), the soloist was booed off the stage half way through the first movement when fully two thirds of the audience began chanting, Pee-Air, Pee-Air!!! Outside the concert hall, demonstrators filled the street. Bidding on this Shostakovich CD just ended (Symphony No. 1, The Age of Gold Ballet Suite). It opened at $9.99 with 27 bids pushing it up to $174.78! I remember that fateful day in 1932 . . . . In fact, the better argument would be that Shostakovich's stock out of all composers past and present, is the one that is rising the most sharply.